So I know I’ve been stretching the definition of faux pas lately. You’ll have to forgive me; it is just my way. This week’s installment is also a stretch, but it seems somehow fitting. One of the snazzy features of my blog platform (WordPress) is that it shows what search terms led people here. Some of the results are understandable, but some, quite surprising – all the way to downright dirty. (Really, there are a couple of X-rated searches that I cannot in all conscience share with you). Now I know it is partly my own fault. I have, after all, written about questionable massage parlors and women wearing no pants. My defense is that I’m just reporting the facts; this really is my (somewhat odd) life! Below are a few searches that have somehow brought people to paris (im)perfect. Dedicated readers will be able to match key words to blog posts. Some searches, though, seem way open to interpretation. Enjoy! I think these searches not only call into question just what kind of blog I’m keeping here (way too many ‘no pants’ searches), but even more so, what are these people actually looking for? Flying kiss boy, for example. Anyone? 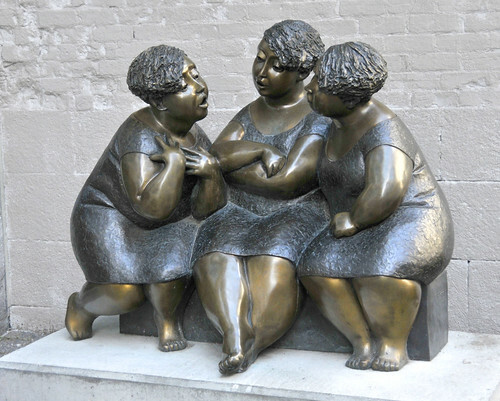 Now one search did seem quite highbrow: “Diane Johnson Elizabeth Hawes.” Two award-winning writers. When I googled this myself, it turns out my Camus post came up number 2 on the results page! But then I started to wonder: What’s the intention behind the search? What do they find? But maybe, just maybe, someone could read this as an insinuation that the two are a couple? (They are not!) Oh, what have I done? Though, really. Spreading rumors + creating controversy= spikes in traffic. Perhaps this should be my new policy? Any bloggers have examples of funny searches that have led people to your blog? Anyone have any idea why ‘blowhorns’ or ‘choree-zoe cone’ would lead someone here? And as always, faux pas examples are always welcome. Maybe you can get me back on track! Should I be worried that I hear several loud noises like gunshots and my first reaction is to keep walking straight in that direction? Did curiosity really kill the cat? Well, I claim neither bravery nor stupidity (in this case), as I was pretty sure I knew the source of these strange sounds. 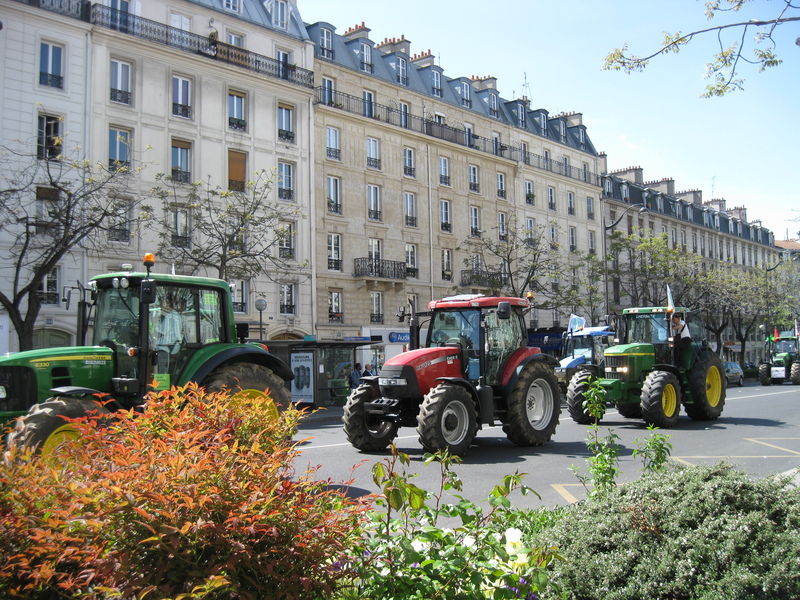 Yesterday thousands of tractors rolled down the streets of Paris. As someone who loves the meeting of incongruous elements, I got a kick out of seeing large farm machinery clogging traffic in the City of Light. 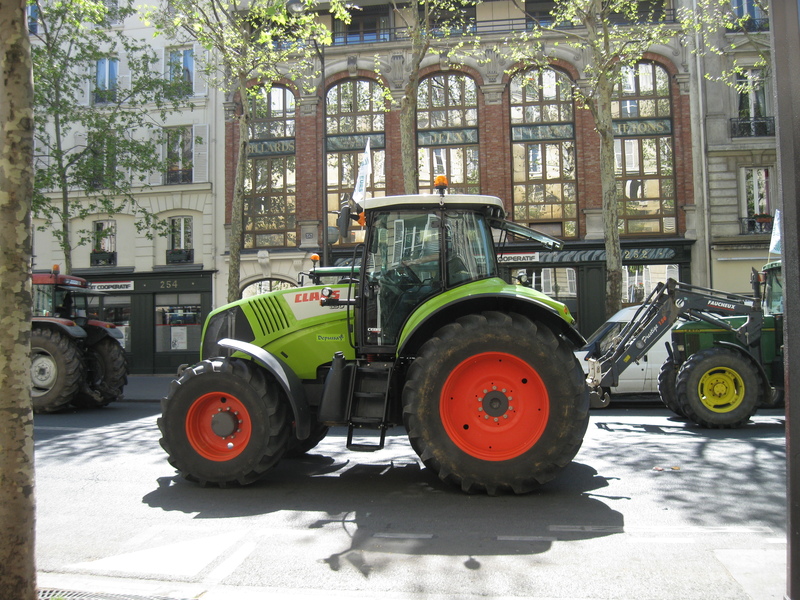 John Deere isn’t a name I typically associate with Paris, but behold, a whole fleet took over the boulevards. As much fun as it is whining about the perpetual state of strikes, spectacles, (or what the French like to term “social movements”) in France, sometimes there really is a reason. I’ll let the political bloggers give a full analysis (or see here for more background), but the farmers have a point. Their costs are rising, prices falling, and EU deregulation is no help at all. You know how people love quaint French markets? We conjure a romantic picture of a family farm where such good food is grown? Well, that’s hardly the working reality anymore. Agriculture is in crisis and small-time farmers are fading fast. I did see a young woman do just that, though, and the older man driving the tractor seemed delighted to suddenly find himself in her company. 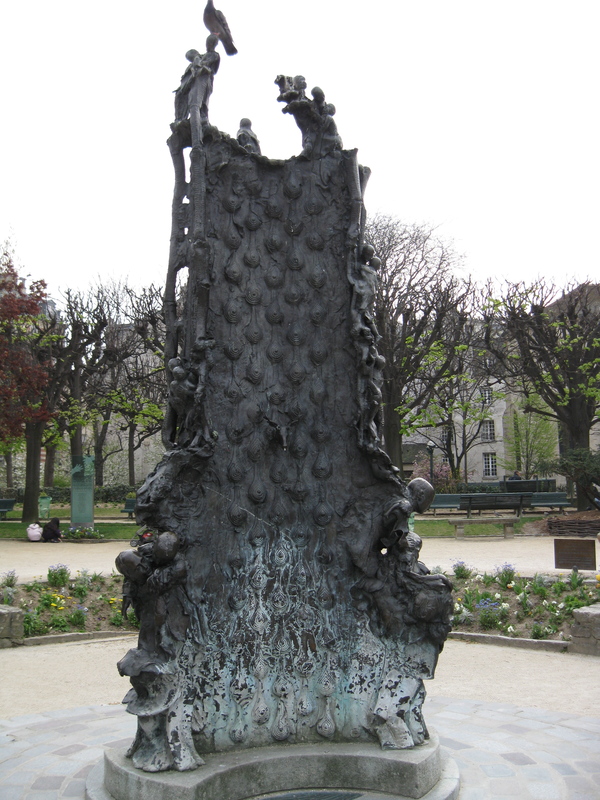 Most protests in Paris take place at Bastille or Place de la Republique. The tractors hit these two hots spots, but they also made their way to Nation, not too far from where I live. So at least I had one take-away from the day: If you wait long enough, moving farm equipment will find its way to you. Watch out below! Name-dropping ahead! “So there is a bathroom we can use in here,” I said to the woman as she sat back down next to me. “Yeah, I wouldn’t have been able to stay otherwise,” she said. This, my friends, is an example of my sparkling conversation with the literati at a recent Village Voice reading. 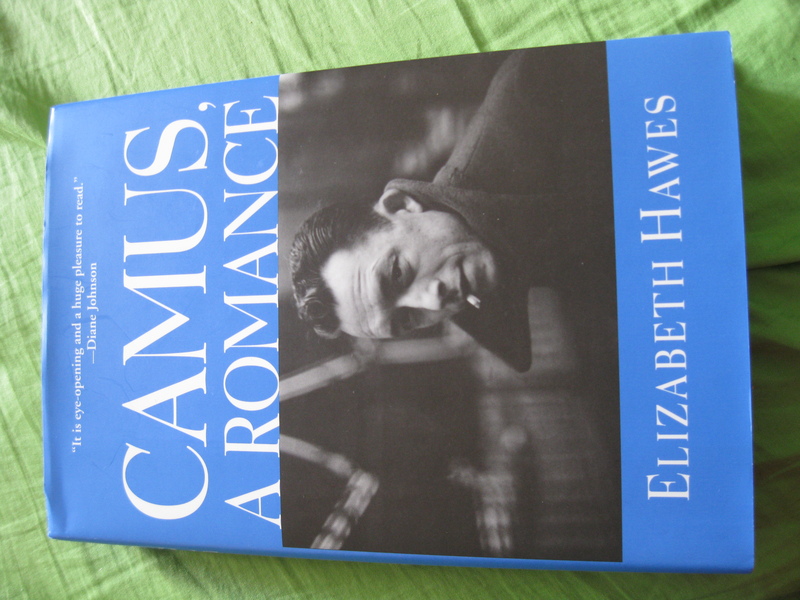 Last week, Elizabeth Hawes, a former New Yorker contributor, presented her biography Camus, A Romance to a packed crowd. I have to admit I wasn’t particularly motivated to go to the reading at first. I’ve been riding the positivity high of late, and an evening talk on Camus just sounded like, well, not exactly a funfest. Thankfully I went (note to self: I’m always glad when I go). It was a fascinating talk, I picked up a new book, and I’ll soon be better equipped for literary cocktail conversation after reading it. I clumsily made my way into the small folding chair (although the folding chairs are about the size of a nickel, so I’ll forgive myself for being less than graceful). I apologized to the older man behind me for blocking his view (I’m tall) and moved on to toilet talk with the woman on my left. “Albert Camus is a much simpler hero for Americans than for the French,” Hawes said at one point during her talk. From my own limited perspective, that’s certainly true. I’ve read The Stranger, his connection to Sartre rang a bell. I knew Camus was Algerian by birth with a brooding Bogart look about him, a cigarette always between his lips. Basically, I had an almost cartoonish image of a bright existentialist thinker, if you will. The talk (and I’m sure even more so the book, once I finish) set me straight on a lot of points (not least of which is that Camus rejected the label of existentialist and had a falling out with Sartre that would have implications for the rest of his life). So it’s a bit of an existential faux pas this week, but wow, just how could I have forgotten Camus? And living in France, no less! One of the most potent feelings I’ve had to contend with in France is that of being an outsider. I have lived in other countries (I studied in Ghana and Mexico), yet never experienced the ‘foreign feeling’ as much as I have here. I even wrote a long essay recently about being a foreigner in France and the society’s (non)discussion of race (yes, I do sometimes tackle more serious topics). 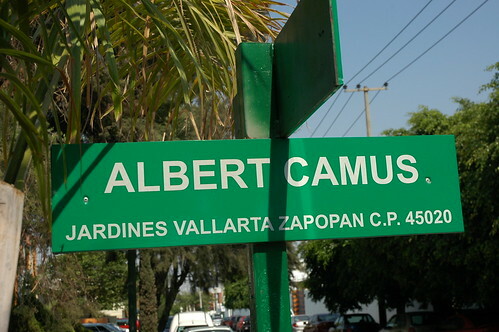 And yet I’d been ignoring Camus, the classic writer of alienation! (Better that I didn’t think about him too much while I was writing my essay, though. I probably would have put my pen down otherwise, realizing my own attempts futile). 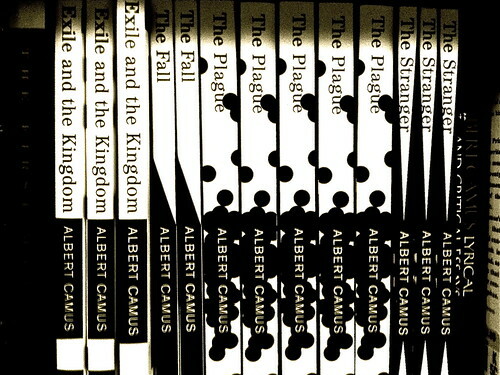 I wonder what I’d make of Camus’ work now. Would it resonate with me more now that I have lived here? I might even be able to read them in the original French. 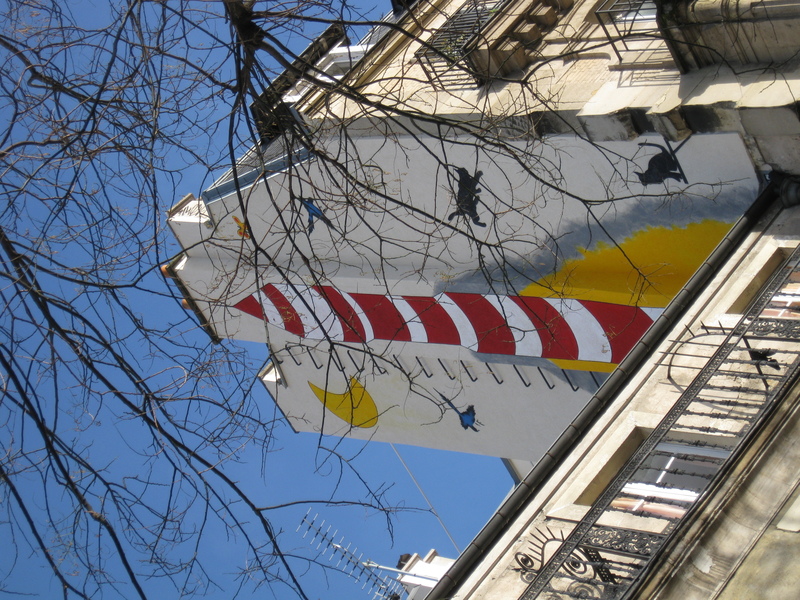 (Though I have some perhaps surprising thoughts on translation vs version originale. Maybe for another post). Near the end of the evening’s event, when the floor was open to questions, the older man behind me rose, and as he put it, “revealed” himself. He was William Jay Smith, a celebrated poet and teacher, and one time Poet Laureate to the Library of Congress. (Geez, as if I wasn’t already feeling like the riff-raff). With tears in his eyes he recounted having met Camus and vouched for his integrity. (One of the most fascinating parts of the talk was the discussion about the rejection Camus suffered after initial fame. It’s only been recently in France – and Algeria – that he’s seen his reputation revived again. Even his own countries forgot him, in a way). So, a moving and stimulating evening all around. I waited awkwardly to have Hawes sign my book – all the literati were now talking amongst themselves – and then she finally turned to me. I am an active listener, interested and encouraging; it’s not the first time someone has said that to me. I may be a faux pas, but I have a nice face. Fine trade-off, right? Ok, not an original answer, but the sentiment still stands. When Anja of Ever the Nomad introduced herself in my inbox recently as a professional travel writer, she had my full attention. (Didn’t hurt that the first sentence of her email also said that I did “amazing work.” Yes, flattery does work). Before responding to her request for a guest post, I did what any reasonable person in this day and age does: I googled her. The drooling soon began. Anja has written guide books for Lonely Planet and Rough Guides, articles for Time Out and Travel + Leisure. Since I started following her on Twitter, she’s hopped from London to New York to a sea-view pool villa in Thailand. 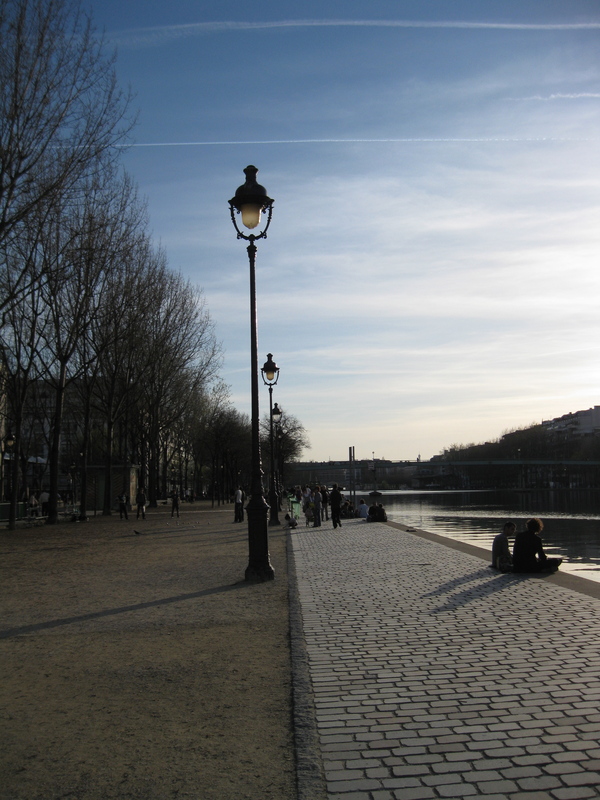 Once I stopped daydreaming (not sure I’ve stopped, actually), I realized how pretty darn cool it was that she wanted some Paris insights from little old me. The Promenade Plantee - check out *them* blossoms! As a confirmed cheapskate and with the coming of spring, I found one subject the most natural to write about: places to frolic for free. And since it’s exactly four years ago this month that I fell in love (literally) with Paris + a boy, it was time for a little nostalgia. 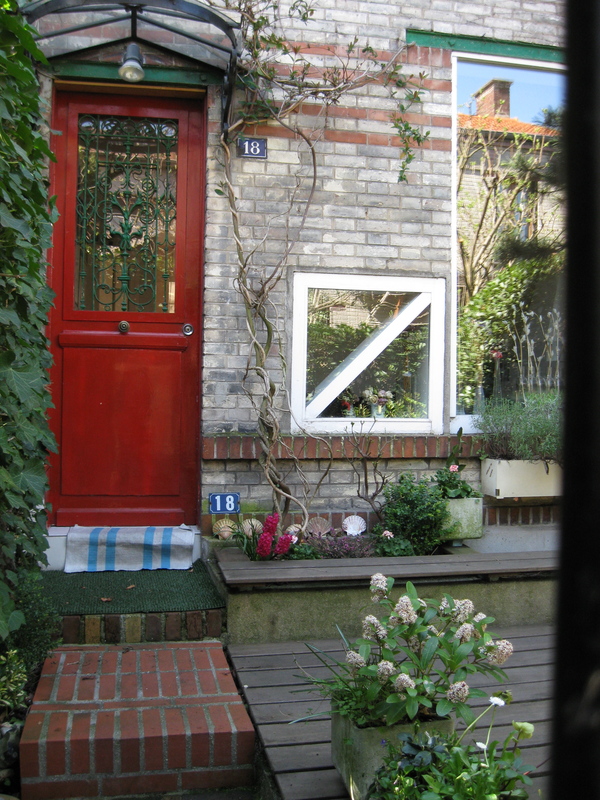 The 19th was my first home in the City of Light, so I have plenty of favorite nooks in that humble, but humming arrondissement. Please find below a few sites I mentioned in the guest post, then follow the link if you want the full story. Enjoy! P.S. I’ve taken a bit of a revised position now. Travel writer would be awesome. But someone paying me to “hang out” in Paris and write up the results could be the real prize. So, friends: Do you read any such job in my future? • The side streets off Rue de Mouzaïa beckon with a rows of adorable bungalows. Wisteria creeps up brick houses, brightly-painted doors hide behind latched gates. Wander small passages with grand names, like Villa de la Renaissance or Villa de Progrès. 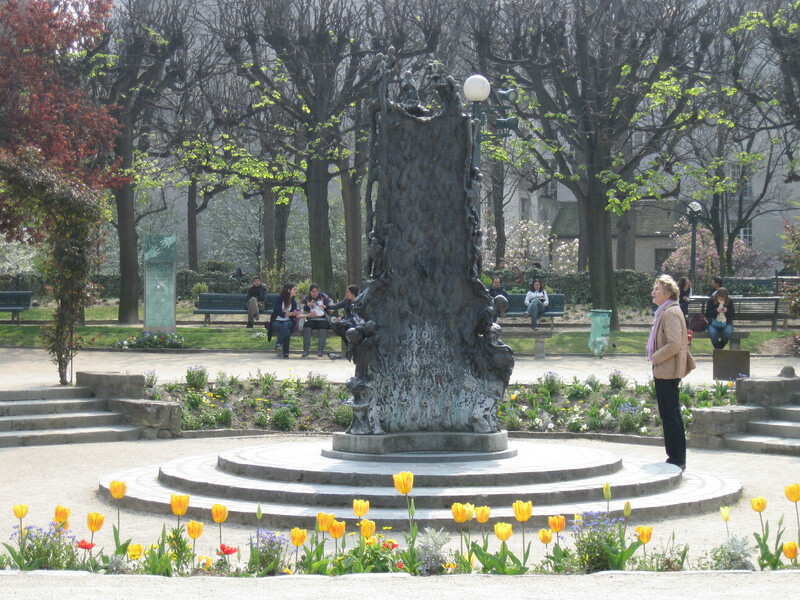 (The three pillars of the French republic, in fact – Liberté, Egalité, and Fraternité – all meet at one street corner here). • Buttes Chaumont is one of the most gorgeous parks in Paris, yet it’s rarely given its due. From the Sybil temple perched high atop a cliff to hidden grottoes and gushing waterfalls, this park is at once dramatic and relaxed. 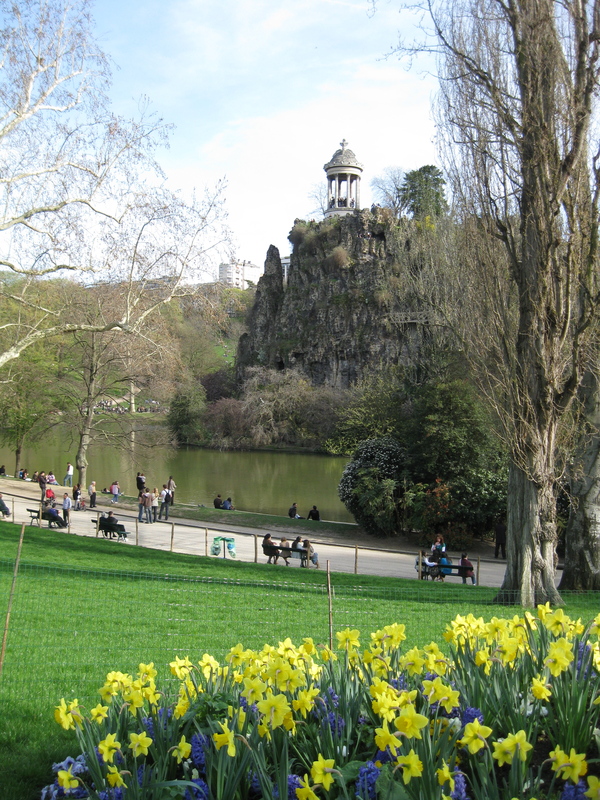 Unlike the many manicured parks in Paris, Buttes Chaumont seems more rugged and untamed. 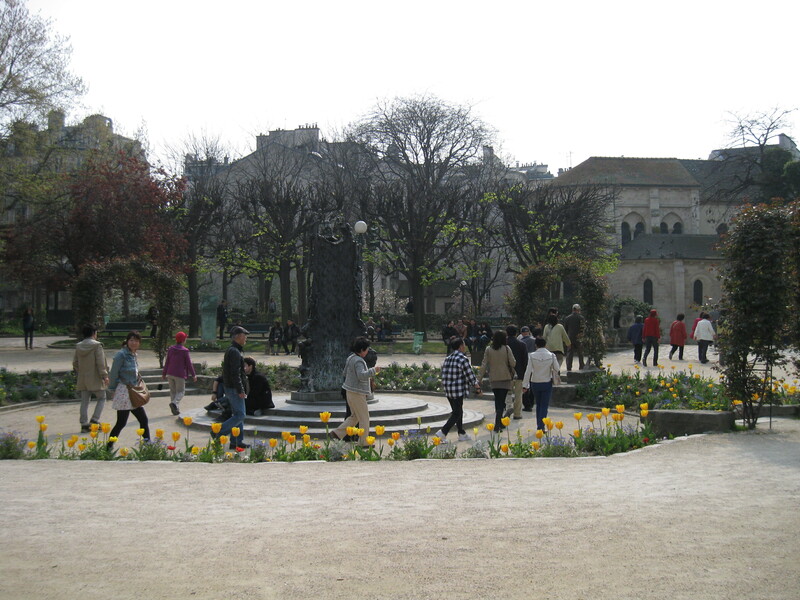 • Nearby Parc de la Villette also lets you grace the lawns. 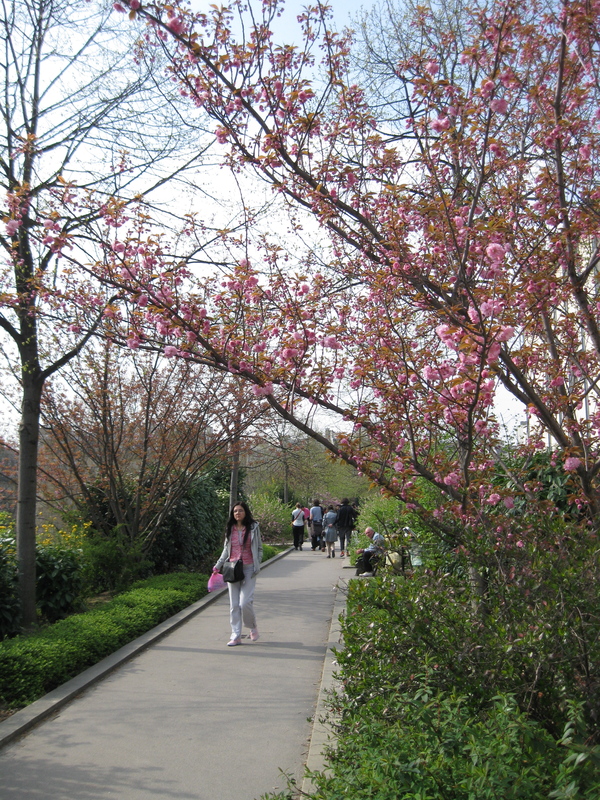 Flat and modern, it’s nothing like the hilly wonder of Buttes Chaumont, but it boasts interesting multidisciplinary complexes like the Cité des Sciences et de l’Industrie and offers several of the summer’s best events. Villette Sonique presents big-names and up-and-coming indie acts while the outdoor movie series draws crowds with its wonderful selection of free films. I know I was gushing positivity about Paris just yesterday, but today I’m leaving. Well, just for the weekend. Sometimes it’s good to get away. So, if you’ve come here looking for Faux Pas Friday, (first, thanks! ), I’m afraid that my faux pas is not having one to share with you this week. I’m on the road (erm, on the train) as we speak. But won’t it be fun to see what new rules I might break in a different region? 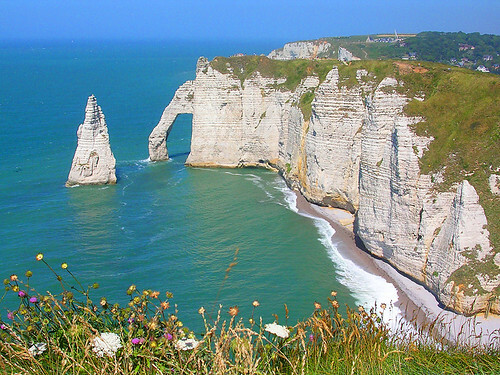 Upper Normandy, here I come! In even more exciting news, I have a guest post appearing any time now on another cool travel blog. Only it’s being posted on US time so it’s not up yet. I’ll post it for Tuesday TIPs when I get back. Aren’t you just dying to know more about this guest post? No? Well, ok, I’m still excited. Yesterday I picked up my new carte de sejour. Ah, one more year of sweet legal residence is mine! I’m not sure what special juju I’ve got working for me, but Paris is just being so good to me right now. The prefecture, for instance, has never been one of my favorite places. (It has, in fact, been the site of much pain). But yesterday a smiling guard greeted me. Yes – smiling. “You must smile, too, Madame. No smile, no pass,” he said in a jocular way that made my jaw drop. How wonderful to actually be instructed to smile in Paris! And in the Prefecture of Police no less. Next I entered the courtyard. A massive construction site awaited. I couldn’t immediately see how to get around the barriers to my correct salle. A friendly construction worker came over of his own accord and pointed the way through the rubble. (I wasn’t wearing revealing clothing, in case anyone was wondering). I picked up my card without a hitch. I’m not what you’d call New Agey, but I do believe that what you put out to the universe often comes back to you. It’s a matter of physics, too: energy can neither be created nor destroyed, only transformed from one state into another. 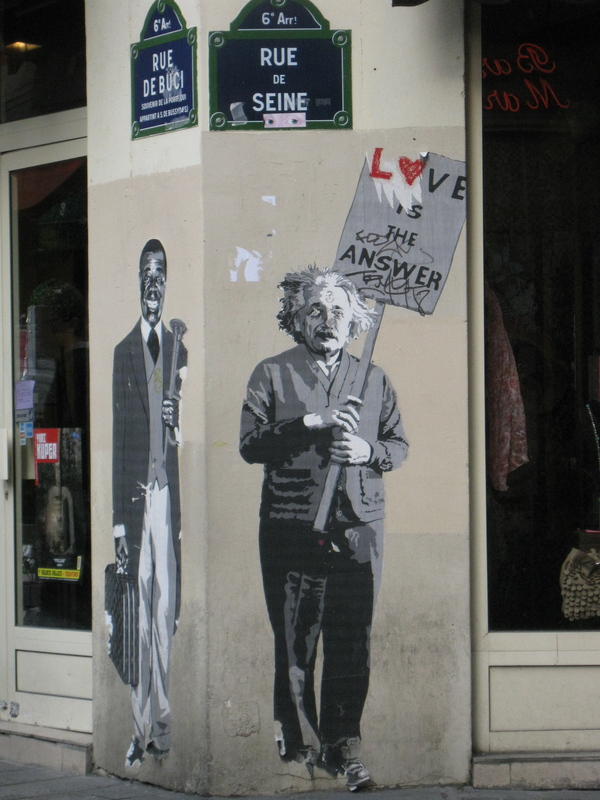 Positive energy (at least in my interactions with Parisians) seems to be feeding on itself lately. I’m now receiving customer service. People smile back at me. I no longer receive (as many) reprimands for my fumbling foreigner ways. Same amount of energy, it just seems to have swung from negative to positive. I don’t want to jinx this jovial run by talking about it too much, but I do have my theories. When I first moved to Paris I was open and ready for adventure (who else buys a one-way ticket to a country where they don’t speak the language, has no job in sight, and moves in with someone they spent less than three weeks with? Yeah, me). I was soon disheartened, however. 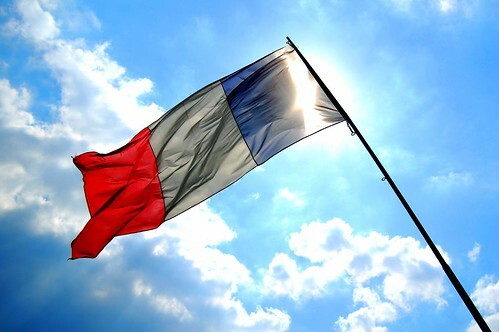 My smile was rebuffed, my loud laugh scorned, my efforts to speak French ridiculed. It wasn’t from lack of trying that the “positive thoughts” route didn’t seem to work. The confident, independent woman l had become in New York shriveled by the day. So what changed? Somewhere in the past few months I’ve slipped into a full acceptance of where I am. While yes, before I was open to what was happening in Paris, I still held onto this yearning for New York. While yes, I was making every effort to build a life here – and I did, finding a “real” job, learning the language, even getting hitched! – I still wasn’t sure that this was really where I would stay. And then, ’round about year three, it just sort of happened. Paris became home. I stopped constantly comparing the city to where I had come from. I didn’t take hurtful comments so much to heart. I put my sneakers back on, let loose my loud American laugh and stopped caring what people thought. Because this is who I am, and I live here, too, damn it. I think the Parisians might have picked up on this. Somehow they know I’m no longer a temporary visitor, but someone who’s sticking around. Of course, I’ve been on the expat rollercoaster long enough that I know this high might not last. But it serves as a nice reference point, and boy, will I hold onto these moments when I’m down. It hardly felt like bureaucracy picking up my residency card yesterday, but we do still have another outstanding bureaucratic issue. The double taxation problem had finally seemed to reach resolution, but just this week it came roaring back into our lives. Jerome’s been dealing with this one (hey, I have enough paperwork to deal with, he’s in charge of the taxes for his own country! ), but I almost felt tempted to step in. Maybe he just doesn’t have the same positive juju working for him right now. But I decided against it. I mean, this juju probably has its limits. If there’s only so much energy in the world, there’s only so much to go around. No need to push my luck, right? And then crowds of tourists came and disturbed the calm. I am so not a tourist anymore! Celebrate! …at least according to Einstein. And he was really smart. *(From my adventures you’ve probably gathered that I mainly rock the Right Bank, but I show the Left Bank love, too).